The Lady Washington was one such trading vessel. She was built for duty on the east coast of the Americas as a tall masted sloop and was converted to a split rig (two relatively shorter masts) in 1787, about 20 years later. Ted Brewer has discovered that the vessel was built in Essex, Connecticut and crossed the Atlantic at least once bringing Irish immigrants to the New World. She was later sailed to Hong Kong where the shorter masts and easier to handle sails were installed. The Lady Washington was the first US built vessel to circumnavigate the globe. Her furthest aft sail is called a spanker on European built square riggers. American sailors in her time preferred to call her kind brig-like or brigantine, which is appropriate given that what looks like a spanker is the largest and hence really the main sail. Most sailors today call her (incorrectly) a brig. 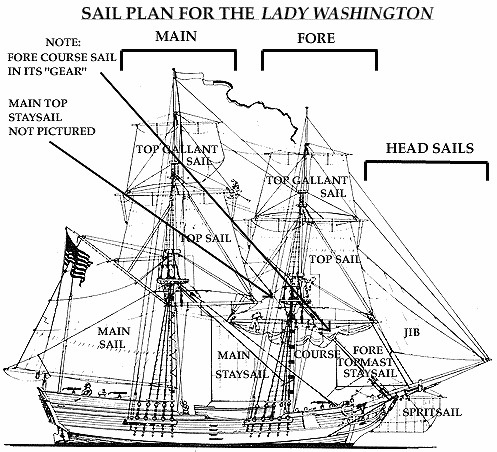 It is likely that the special-route trading vessels, like the sloop Lady Washington (the brig rig is pictured), contributed to the belief that a tall masted vessel points better than a short one. This is not correct. The tall masted vessel on the east coast of America could reach and therefore be sailing different wind than others. 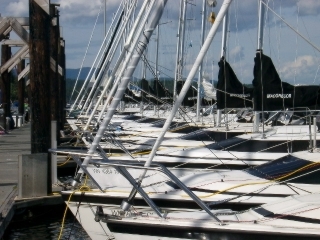 Furthermore, the argument that in light wind conditions a tall mast will catch wind that is more powerful than the wind scraping the surface of the water ignores the the notion that putting up all cloth in light wind (especially top gallant sails) will produce drag that is not overcome when there isn’t enough wind to lift them. The Lady’s rig was split prior to circumnavigating likely owing to that notion and recognition that a mainsail of several thousand square feet was difficult to handle. On the west coast of America, and in most popular cruising areas, a mast can not be built tall enough to get observations of better pointing. The winds for all practical purposes, other that the east coast of America and areas like that coast, are pretty much coming from the same direction at the top of the tall mast as they are at the boom. Hence there is no advantage for the tall masted recreational vessel over a similar vessel with a shorter mast but same sail area. In fact there is disadvantage coming from the higher weight aloft of the tall mast rigging, and cloth which reduces stability. 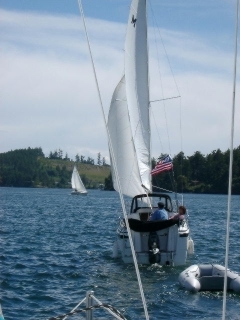 Advantages come from sail shape, not the height of the mast, assuming the wind isn’t obstructed. After several enjoyable years of experience with the 26X we decided that it might be fun to see if we could “push the envelope” a little to explore potential improvements in sailing performance. Planning began, and before long we were trying out new parts on our demonstrator boat, splicing mast sections together and talking to our sailmaker. I felt that real improvements could be made to sailing performance by installing a new taller mast which would eliminate the need to use a Genoa altogether. The project began with drawings and calculations on how the changes would affect the center of effort of the sail plan, and hence the balance of stability of the boat. After running my ideas past Roger Macgregor and several sail makers, I decided on a fairly radical addition of 3.5′ to the mast height while raising the head-stay to the original masthead height of 28′. Initial tests conducted by temporarily installing the new rig on our demonstrator boat provided lots of important data. The two most important bits of information were that the first jib was cut too low and fought with the lifelines (toss out a brand new Mylar laminate jib! ), and that the mast was just not stiff enough in strong winds at this height. Changing to stiffer spreaders helped, but ultimately we decided that the only fix was to convert to a double spreader rig to reduce the spans between support points. We sailed the new double spreader rig on Cheryl’s sister’s 26X to further test and develop it. Ultimately this rig performed beyond our highest expectations with significant improvements in pointing ability, stability and boat speed. The higher performance Main and 105% Jib, along with better control of sail shape from the new rig provided a much wider wind range with full sails, light air performance was great, yet you could sail in much stronger wind without needing to reef the main or Jib. A nice side effect was that the taller, higher aspect ratio rig really looked racy! We eventually sold the tall rig setup. These are photos of the MacGregor 65, one of the fastest and most beautiful sailing yachts ever built. Over an 8 year period, MacGregor 65 Corporation built 100 of these magnificent yachts. During it’s production run, it was the best selling large yacht in the history of sailing. The MacGregor 65 holds many long distance sailing records. It was also one of the finest long distance cruising yachts ever built. In 1995, when MacGregor Yachts first became swamped with orders for the newly introduced MacGregor 26, the 65 was taken out of production to devote MacGregor’s entire five acre site to the production of the 26. The 26 is still selling beyond our wildest dreams, and we will continue to concentrate on production of the smaller boat in order to meet the huge volume of orders. MacGregor 65 Corporation is, however, continuing to develop and engineer a 70′ version of the 65. Two of the new 70’s have been built, and are being actively sailed and tested. In future years, the big boat, the MacGregor 70, will again be coming off the MacGregor 65 Corporation production line. Above is a picture the the company’s 70″ Anthem, recently converted to a ketch rig. In its introductory race with the new rig, (the 120 mile, 420 boat race from Newport Beach, California to Ensenada, Mexico), the boat was one of the first to finish, beating many of the very best west coast racing machines, including Merlin and Ragtime, as well as most of the big racing catamarans and trimarans. Anthem is one of the fastest cruising yachts ever built. If the boat is put back in production, this is the likely configuration. Even though Anthem carries a very fast PHRF rating of minus 42, it still did quite well on corrected time.